I welcome all of you with my love and respects. I welcome all the devotees, disciples, samajis, satsanghis, sitting with us through Nithyananda TV, Sadhna TV, Lotus News Channel, Eshwar TV, and two-way video-conferencing in thirty-four places, in twenty-three countries around the world. I welcome all of you for this Kalpataru Nithya Satsangh. And, before entering into the satsangh, I wanted to take a few minutes, a few seconds to express my deep condolences to Jagadguru Kripalu Maharaj’s devotees, disciples. Yesterday morning, Jagadguru Kripalu Maharaj attained Mahasamadhi. He left for the divine abode of Goloka. And, Maharaj is one of the great pillars of Hinduism. He and his Sangha, his organization, have done so much to Hinduism…..unimaginable contribution! And, such a humble being after contributing so much; he is a ninety-one-year-old great Jeevan Muktha! And, I and the Nithyananda Sangha offer our respects to Kripalu Maharaj and deep condolences to his Sangha and his Sangha members. Today, Nithyanandeshwara Brahmotsava 9th day! So, Mahadeva, Nithyanandeshwara, is gracing us in a special floral decoration with Nithyanandeshwari having a flower crown. And today, Nithyananda Hindu Sangham in Malaysia is celebrating Diwali Unity Celebrations at Banquet Hall in Malaysia Medical Academy, Kuala Lumpur. Blessings for the program! All the Hindu organizations – ISKCON, Saiva Siddhantha Mantram. Brahma Kumaris, Rudra Samaj, Divine Life Society, Sri Vidya Peetham– all of them have been invited. Blessings! 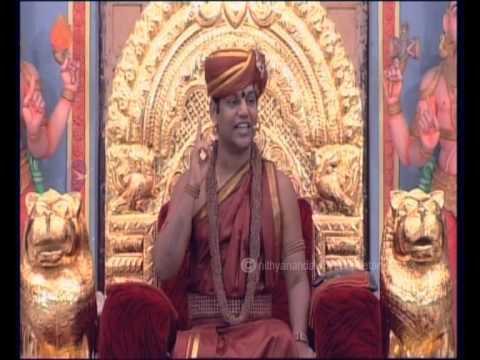 And, today, Nithyananda Hindu Sangham is also starting a project. They are going to feed one lakh people, 100,000 people on Thaipoosam. Blessings for the project! It will be successful! It will be successful! And, in the Batu Caves one million devotees will gather. Nithyananda Hindu Sangham is going to feed 100,000 people. Great! And they also want to enrich at least 10,000 people with the Four Powers classes. Great! My blessings! This project will be successful! I will move to today’s satsangh. I will expand on the concept of “CREATING A SPACE” today. The whole Cosmos itself was created when Mahadeva decided to create a space for the universe. Mahadeva, in His pure form, is Shiva. When He created a space for the world to happen, that is Hiranyagarbha, from there the Shakthi radiated, and this whole universe happened. Please understand! Use exactly the same technique to create what you want in your life! So understand, when you create a space, this is the first thing you face. So complete with that first! Completion with that is the most important thing. And the second problem will be: You will trust ‘Yes, if the space is created it will become reality, but, will I be able to create that space?’ That is the second doubt. Again, this is also incompletion due to confusion and earlier failures. Fool, last time on the invitation, you did not put the date and time! You give a big lecture, ‘No, no, you don’t know, I picked and chose the cards, I went to the printing press, I gave the model, looked at the proof, I printed, I put the address and sent it to them; I just forgot one thing – date and time! Then how can they attend? Last time you failed because you missed something vital, so this time don’t miss it, that’s all. Please listen! Create the space for what you want by visualizing it in the present! Bringing your past hangover into the present is ‘Incompletion’, bringing your future possibility into the present is ‘Space’. Please listen! Bringing your past hangover into the present is ‘Incompletion’. Bringing your future possibility into the present is ‘Space Creation.’ Bring your future possibility into the present and decide that you will not challenge the power of the Space, but you will take the responsibility to fulfill that space! You always have only these two attitudes: either you side or oppose! Because you start doubting the power of space you start doubting, ‘eh, I created the space for ten crore to come to me, will it come or what, I’ll challenge! Who is ready to take the challenge on the other side? Nobody! You are challenging the air, empty space or yourself! God is not coming and standing there telling, ‘O, my son, I am the guarantor for the space creation. Come on, you are throwing a challenge, I’ll take up the challenge, let us fight!’ No! He just says, ‘Tathaasthu!’ and goes away to carry on with His life! So, listen, when you create a space, stop fighting with it, stop challenging it. Start taking responsibility for it. Start taking responsibility for the space you have created. Listen! Extraordinary enlightenment science is being revealed to all of you in a most simple, possible, practical way. Please take it up. When you create a space, complete with all the incompletions and complete with the doubts which happen in you, the doubt whether you can create the space, doubt whether the space will really become real. Complete with all that. And, this is the most ultimate, most important and ultimate: Do not fight with the space created. Take responsibility for the space created. If you have created a space that you will be completely healed, you will become healthy, don’t fight with it, don’t challenge it; take responsibility for it. Please sit straight. Close your eyes. Cognize your future possibility as present reality. Create a space for what you want. Pick up one desire, one thing you want to make as reality and create the space for it. Complete with all the self-doubts you have. Complete with all the doubts whether you can create the space or not you have. Complete with all that. After completing with all your self-doubts and creating the right space, declare that now you will take the responsibility for making the space into reality. Complete with all the incompletions you have about responsibility. Sit with the decision to make the inner space into reality with a deep feeling of being responsible. Stop fighting with or challenging the inner space you created. Instead, support and take responsibility for the inner space you created. I bless you all! With Integrity, Authenticity, Responsibility and Enriching, let you all experience the inner space you created as reality! Let all the auspiciousness happen in all of us!